Although sentinel node biopsy (SNB) is becoming the standard approach for axillary staging in patients with small breast cancer, criteria for patient selection and some technical aspects of the procedure have yet to be clearly defined. The aim of the present survey was therefore to investigate the way in which SNB is used by general surgeons working in the Veneto region, Italy. A 29-item questionnaire regarding various aspects of SNB practice was mailed to surgeons in charge of breast surgery in all the 56 surgical centres of the region. The rate of response to the questionnaire was 82.1% (n = 46); 69.6% (n = 32) of the respondents routinely perform SNB in their clinical practice. Most of the interviewed surgeons (93.5%) expressed the belief that the acceptable false negative rate should be ≤5%. However, among the surgeons who perform SNB, only 34.4% performed more than 20 SNB during the learning phase. Indications are limited to tumours of ≤1 cm by 31.2% (n = 10) of respondents, ≤2 cm by 46.9% (n = 15) and ≤3 cm by 21.9% (n = 7). Almost all respondents (93.7%) agreed that a clinically positive axilla is a contraindication to SNB, while opinions differed widely concerning other potential contraindications. In most of the centres considered, SN identification is undertaken on the day before surgery using a subdermal injection of 30–50 MBq of 99mTc-albumin-nanocolloid followed by lymphoscintigraphy. SNB is currently performed in the majority of hospitals in the Veneto region. However, the training phase and criteria used for patient selection differ from centre to centre. Certified training courses and shared guidelines are therefore highly desirable. For many years, axillary lymph node dissection (ALND) has been considered the standard of care for patients with invasive breast cancer. However, two-thirds of women with early breast cancer do not have nodal metastases and gain no therapeutic benefit from ALND. Moreover, the rate of morbidity following this procedure is high. Sentinel node biopsy (SNB) for breast cancer was introduced in the mid 1990s as a mini-invasive, sensitive tool for axillary staging that allows ALND to be avoided if the sentinel node is metastasis-free. The technique raised great interest and was rapidly adopted into the clinical practice. Some authors have questioned the widespread use of SNB rather than standard ALND. SNB has not yet been validated in clinical trials, as is customary before applying a new medical procedure to clinical practice. All published phase I-II studies report a low, but significant, rate of false negative results (SN negative with other axillary nodes positive)  and the long-term impact of under-staging and possible under-treatment on relapse and mortality rates is still unclear. As yet, only one randomised trial reporting outcomes at five-years has appeared in literature, and it found no difference between the disease-free survival of patients randomized for ALND or SNB followed by ALND only if the SN was positive . However, because of the relatively small number of patients evaluated (516), no final conclusions can be drawn. Moreover, it is doubtful whether community general surgeons can quickly achieve results comparable with those published by academic centres with extensive specific experience. However, in a recent Consensus Conference (Philadelphia, April 2001) , it was claimed that SNB, as a diagnostic procedure, does not require validation by clinical trials and that the experience so far obtained with observational studies is reliable enough to warrant its use in clinical practice. Moreover, the Italian media have reported that SNB is as a harmless and safe procedure whereas ALND is obsolete. Therefore many patients with breast cancer specifically demand SNB and refuse to enter randomised clinical trials comparing the two procedures. The use of SNB has thus spread rapidly from large academic surgical centres to small community hospitals, but many aspects of patient selection criteria and some technical details of the procedure still need to be better defined and are currently open to personal interpretation. The purpose of this paper was therefore to investigate how general surgeons involved in breast cancer treatment in the Veneto region, in North East Italy, use SNB in their clinical practice. To our knowledge, no papers regarding this issue have yet been published in Europe, although some surveys have been carried out in the United States and Canada [4–7]. In May 2003, GIVOM (Gruppo Interdisciplinare Veneto di Oncologia Mammaria), an Italian co-operative group dedicated to the study of breast cancer, mailed a 29-item questionnaire [see Additional file 1] to surgeons in charge of breast cancer surgery in all the 56 surgical units of the Veneto region, which has a population of 4.5 million. Overall, the surgical units operate on approximately 3,500 breast cancer patients a year. Reference was made to the Venetian Tumour Registry (data not shown) to establish the number of procedures performed for breast cancer surgery in each unit. The settings for the clinical practice of surgeons were classified as community, regional and academic. A cover letter was sent with the questionnaire to provide background information and explain the study aims. The questionnaire contained multiple-choice questions subdivided into three sections. Section 1 was designed to ascertain whether the interviewed surgeon currently used SNB rather than ALND outside the setting of clinical trials, whether s/he believed that scientific experience gained so far is sufficient to justify the use of SNB in clinical practice and whether s/he felt obliged to perform the procedure because of patients' demands, induced by media propaganda. Section 2 contained questions concerning training surgeons had undergone before using the procedure as standard practice, criteria they used in selecting candidates for SNB and the technique they used for sentinel node localisation. Section 3 investigated technical aspects of the procedure, such as type of tracer and doses used, site of injection, timing of surgery. A second questionnaire was mailed to all surgeons who had not returned the first questionnaire within 30 days. Responses, fed into a data-base, were analysed using counts and percentages. Forty-six out of 56 surgeons (82.1%) completed and returned the questionnaire. Of the 46 completed questionnaires, 32 were returned following the first mailing, and 14 following the second. Practice setting and volume of breast cancer surgery did not influence the response rates, as shown in Table 1. Thirty-two (69.6%) of the respondents currently perform SNB in their clinical practice. All the 8 respondent surgeons in charge of breast surgery at academic centres reported that they used SNB, while only 11/13 surgeons working in regional centres and 13/25 of those working in community hospitals performed this procedure (100%, 84.6% and 52.0% respectively, p = 0.004; χ2 for linear trend) (Table 1). SNB was used more frequently by surgeons who perform over 60 breast cancer operations per year than by those with a smaller case-load, but the difference was not significant (Table 1). Of the 14 surgeons who did not perform this procedure, 11 stated that their reasons for abstaining were organisational (nuclear medicine and/or probe for radio-guided surgery not available), while the remaining 3 believed that SNB is still an experimental procedure. Forty-three of the 46 surgeons (93.5%) expressed a belief that experience gained so far world-wide with this technique is sufficient to warrant its use in clinical practice. However, 31 surgeons (67.4%) believed that the indications for, and limitations of, the procedure have yet to be defined. Many of respondents (72.7%) felt they were somehow obliged to offer SNB as standard practice because some patients insist on undergoing this technique as they are influenced by media propaganda in favour of SNB. Most respondents (93.5%) stated that the highest acceptable false-negative rate should be equal to or less than 5%; the remaining 6.5% considering rates of up to 10% acceptable. The time distribution of centres routinely performing sentinel node biopsy is shown in Figure 1. 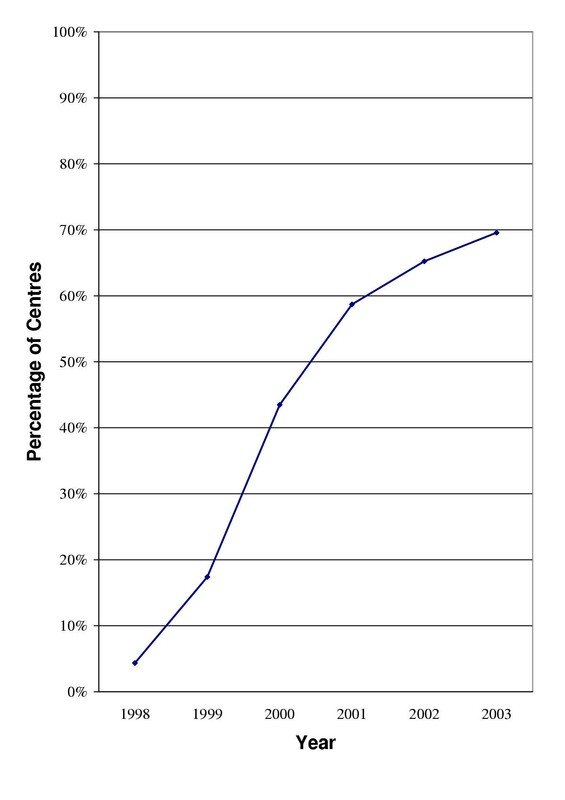 Percentage of centres performing sentinel node biopsy as standard practice from 1998 to 2003. The number of cases of SNB undertaken during the learning phase before abandoning ALND varied: out of the 32 respondents who currently used SNB, 7 (21.9%) performed less than 10 training procedures, 14 (43.7%) between 10 and 20 procedures, 4 (12.5%) between 20 and 30 procedures and 7 (21.9%) more than 30 procedures. The size of the primary breast tumour strongly influenced selection of candidates for the procedure: 10/32 surgeons (31.2%) performed SNB only if the tumour was <1 cm, 15/32 (46.9%) extended the indication up to 2 cm and 7/32 (21.9%) up to 3 cm. None of the respondents performed SNB in patients with tumour diameters greater than 3 cm. The opinions of respondents concerning contraindications to SNB are summarized in Table 2. Most considered a clinically positive axilla an absolute contraindication (93.7%). Neoadjuvant chemotherapy and multi-centric lesions were the other most frequently cited contraindications (78.1% and 71.9%, respectively). Twenty-eight surgeons (87.5%) performed SNB in patients with ductal carcinoma in situ (DCIS): 6/32 (18.7%) in all cases and 22/32 (68.7%) only if the tumour diameter was greater than 2 cm. The surgical strategies for breast cancer treatment using SNB varied: 37.5% of respondents preferred to perform a one-step operation under general anaesthesia, using frozen section examination of the SN and immediate radical breast operation associated with ALND in patients with positive SN; 34.4% performed radical treatment of the primary tumour and SNB, waited for definitive SN histology and then, if deemed necessary, performed a delayed ALND. Finally, 28.1% performed primary tumour biopsy and SNB under local anaesthesia, waited for definitive histology and then performed radical breast surgery associated with ALND if requested. In order to localise SNs, 27 surgeons out of 32 (84.4%) used a radio-tracer (99mTc-albumin nanocolloid), either alone (65.6%) or combined (18.7%) with blue dye injection (Patent Blue). Only 5/32 (15.6%) used blue dye alone. In all the 27 centres in which radioisotopes were used, the tracer injection was made the day before surgery, and lymphoscintigraphy was performed in all but one of the centres. The dose of radioisotope injected was less than 30 MBq in 2 centres (7.4%), between 30 and 50 MBq in 21 centres (77.7%) and more than 50 MBq in 4 centres (14.8%). In patients with palpable tumours, the radiotracer was injected subdermally in the tumour area in 24/27 centres (88.9%), while in 3 centres deep peritumoural injection was used. Blue dye injection, if associated, was made in the subareolar plexus a few minutes before skin incision. SNB was performed in patients with non-palpable tumours in 25/27 centres: the radiotracer was injected subdermally in the cutaneous projection of the tumour in 12/25 centres (48%), deeply in the peritumoural area in 5/25 (20%) and in the subareolar plexus in 5/25 (20%), while 3/25 centres (12%) reported combinations of different routes of injection. When more than one hot axillary node was identified intra-operatively by the gamma probe, 14/27 surgeons (51.9%) removed the hottest node together with all nodes with similar radioactivity levels, 9/27 (33.3%) excised all nodes with radioactive counts higher than 10% of those measured in the hottest node and 4/27 (14.8%) removed all nodes with a radioactivity level greater than that of background activity. Of the 27 surgeons, 20 (74.1%) routinely searched for internal mammary nodes using the gamma probe, even if their attitudes toward biopsy differed: if hot internal mammary nodes were found, biopsy was always performed by 8/20 (40%), while 6/20 (30%) performed biopsy only if no axillary sentinel node was found and 6/20 (30%) never performed a biopsy. Although an enormous number of scientific papers on SNB in breast cancer patients have appeared in literature, few investigate the ways in which this technique is used by general surgeons outside the ambit of specialty centres [4–7]. The findings in the present survey show that the surgical community in the Veneto region believes that the scientific data so far accumulated in phase I-II studies is sufficient to warrant the use of SNB in clinical practice, and most surgeons interviewed in the present study currently use this technique as the standard method for axillary staging in patients with small breast cancer. Most of the surgeons who do not yet use this technique in clinical practice are hindered by organisational problems or are still in the learning phase, while only a small minority believe that this procedure is still at an experimental stage and cannot yet be used in clinical practice. However, the answers given to some specific items in the questionnaire give rise to some doubts, and indicate potential problems. One concerns the potential false negative rate and another the length of the learning phase. False negative SNB, defined as the occurrence of a negative SN in the presence of other metastatic axillary nodes, may have untoward clinical consequences. More than 90% of the surgeons interviewed considered 5% the maximal acceptable false negative SNB rate, in agreement with the rates reported by some experienced surgeons and with the recommendations expressed by the panel of the Consensus Conference of Philadelphia . However, the rate of SN identification and the incidence of false negative cases reported in literature vary greatly The average rate of SN identification using blue dye or radioactive colloids is more than 90%, but results ranging from 65% to 98% have been reported . Even if false negative rates of 0% have been reported [8, 9], most mono-institutional studies report rates ranging from 5% to 10%, even in experienced hands [1, 2, 10, 11]. Multi-centre studies involving community general surgeons are more likely to reflect the situation in the clinical practice setting, and often present false negative rates above 10%. For instance, in a multi-institutional study reported by Krag et al., involving 443 patients and 11 surgeons, the false negative rate was 11.4% . In a survey evaluating the outcomes of SNB in 12 hospitals in British Columbia, Chua et al. reported a false negative rate of 22% . Regarding the Veneto region, in 1999 a pilot study on SNB on 126 breast cancer patients enrolled in four hospitals reported a false negative rate of 10.9% . It is well known that both the detection rate and the false negative rate improve if the surgeon is given a formal, chaperoned training course and if an adequate number of SNB procedures are performed together with complete axillary dissection . Most authors suggest that a surgeon should perform at least 20 to 30 training procedures and achieve a detection rate of >90% and a false negative rate of <5% before embarking on SNB without concomitant axillary dissection . In Italy, there is no program for formal, proctored courses for SNB and no certification is required for performing SNB in clinical practice. Therefore most of the interviewed surgeons are self-taught and more than half of them have performed less than 20 training procedures. In this setting, it appears quite optimistic to expect a false negative rate of <5%, especially in centres where breast cancer surgery is only occasionally performed. Among the respondents, 71.7% felt somehow obliged to offer SNB as standard practice because of patients' demands and press campaigns, and this may have played a role in curtailing the duration of the training period. Similar data have been reported in American and Canadian surveys, which underline the lack of adequate training and the variability in the learning curve, raising doubts concerning the average quality of SNB performed in clinical practice [6, 7]. A further point of interest is the variability in selection criteria for SNB candidates. The size of the primary tumour is a major criterion for patient selection, since it is strictly related to the probability of nodal involvement. Therefore, the performance of SNB in patients with large tumours increases the number of false negative cases and decreases the advantages of the procedure since more patients undergo a completion axillary dissection because of a positive SN. The Consensus Conference Panel of Philadelphia recommends SNB in patients with breast tumours ≤3 cm , although some authors have reported that this technique is reliable also in patients with larger tumours [15, 16]. The present survey shows that there is little agreement on the upper dimensional limit for performing SNB without concomitant axillary dissection: 31.2% of the surgeons interviewed limit SNB to tumours <1 cm, 46.9% to tumours <2 cm and 21.9% to tumours up to 3 cm. In view of the fact that indications for SNB in patients with DCIS are still controversial, the percentage (87.5%) of surgeons in the Veneto region who routinely used this approach appears high. By comparison, Lucci et al. report that only 28% of the American surgeons interviewed in their survey perform SNB in cases of high-grade DCIS . In the present survey, the presence of a clinically positive axilla is considered an absolute contraindication to SNB by almost all the respondents, while only about one third of them abstain from SNB in cases of prior axillary procedures or extensive homo-lateral breast surgery. Interestingly, 21.9% of the interviewed surgeons perform SNB outside of clinical trials also in patients with locally advanced tumours who have undergone neoadjuvant chemotherapy. The presence of non-palpable tumours or a history of previous tumour biopsy is no longer considered a contraindication to the procedure. In their survey on SNB in British Columbia, Chua et al. also reported variability in patient selection criteria and a lack of uniform indications for SNB . Overall, the technical aspects of the procedure for localising SN are quite uniform throughout the Veneto region and are consistent with the protocol used by GIVOM for its ongoing clinical trial on SNB : in most centres, a subdermal injection of 30–50 MBq of 99mTc-albumin nanocolloids followed by lymphoscintigraphy is performed the day before surgery. However, different sites are used for tracer injection in patients with non-palpable lesions. Different opinions were expressed concerning the nodes that should be removed in patients with axillary multiple hot nodes. In the presence of hot internal mammary nodes, which is rare if subdermal tracer injection is used, most surgeons proceed with biopsy. Finally, the strategy of surgical treatment varies, since some surgeons perform SNB with frozen section examination as part of a one-step treatment, while others routinely follow a two-step procedure. The surgical strategy should be tailored to the tumour characteristics and to the patient's wishes, but some key issues, such as the sensitivity of frozen-section examination in detecting nodal micrometastases, should be better defined in order to establish the ideal procedure. In conclusion, the present survey shows that SNB is widely used in surgical practice in the Veneto region, although some centers are still hampered by organisational problems. However, there are relevant differences between the various centres for duration of the learning phase, criteria for patient selection and some technical aspects. Therefore, the surgical treatment given by different hospitals in the Veneto region to women with breast cancer has not been adequately standardized and depends greatly upon the experience and the personal opinions of the surgeons involved. Since the long-term consequences of leaving undetected cancer in the axilla are still unknown, every effort should be made to minimise false negative rates. A self-taught technique and the lack of an adequate learning curve are clearly a wrong way to approach the utilization of SNB in clinical practice. The health authority should therefore promote and support adequate formal training courses to teach inexperienced surgeons to perform SNB correctly, and a quality control programme is urgently required. On the other hand, all the necessary resources should be supplied: gamma-detecting probes for all the surgical units and human resources for the nuclear medicine services, in order to satisfy the increasing demand for lymphoscintigraphy. The authors thank Ms. Denise Kilmartin for editing the manuscript.